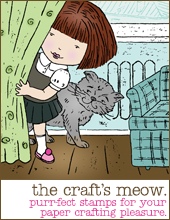 Welcome to the September release blog hop with The Craft's Meow! All five new stamp sets (Autumn Borders, Speaking of Fall (free gift with $60 purchase), Chalkboard Faith, Rustic Greetings and Little Angels) are available for purchase in The Craft's Meow store. You should have arrived here from Angelica's blog but you can find the full list of blog participants on The Craft's Meow blog. On to my projects! 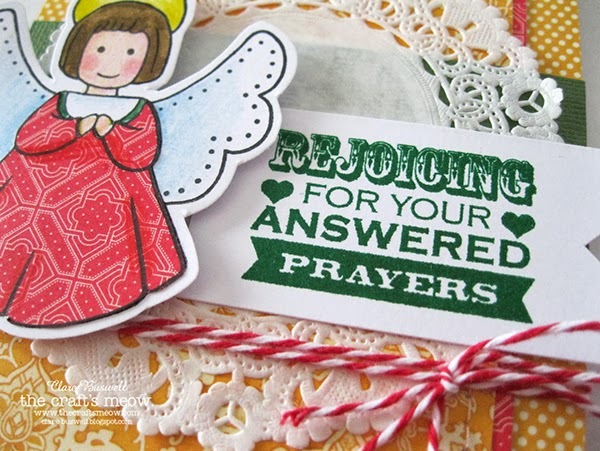 First up is a card using Little Angels and a sentiment from Chalkboard Faith. The little angels are perfect for paper-piecing, I used papers from Graphic45 Bohemian Bazaar and added some color with colored pencils. I also decorated some glassine bags (from SRM Stickers) embossing them with an Anna Griffin embossing folder, adding a doily to the top and wrapping some seam binding and twine around them. 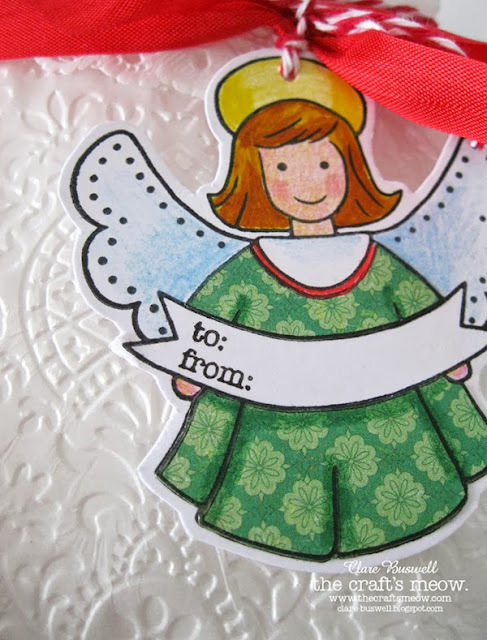 I included a little 'to' and 'from' stamp in the Little Angels stamp set that fits nicely in the banner so the little angel could be used as a Christmas gift tag! I got carried away stamping angels so I ended up making a cute little Christmas banner of angels!! They're all holding something different. You can get some really great effects paper-piecing the angels and it's lots of fun too! Isabelle loved the banner and wants it in her room for Christmas! what an Amazingly Beautiful set. love the Angels and the details are super. thanks for sharing. Clare, you've outdone yourself! This is a heavenly little choir of angels. Love how you embossed the glassine bags too. Thanks for creating and sharing. The angels are so perfect and a welcomed addition to the stamping world for me. Love them! Many wonderful uses for the Angel. Especially like the banner. 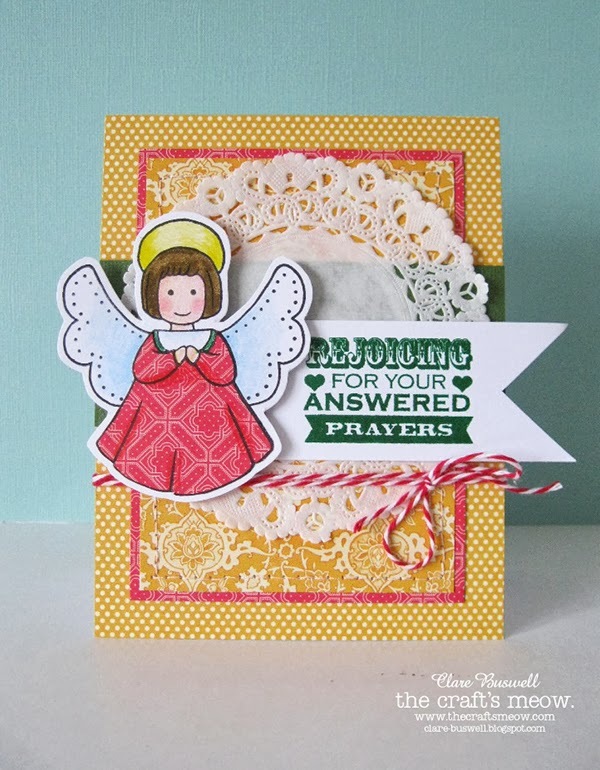 Love the doily behind the angel on the card, Clare. And, that banner??? so cute!! Clare, I LOVE your garland! Great way to show off all the elements of this beautiful set - well done! 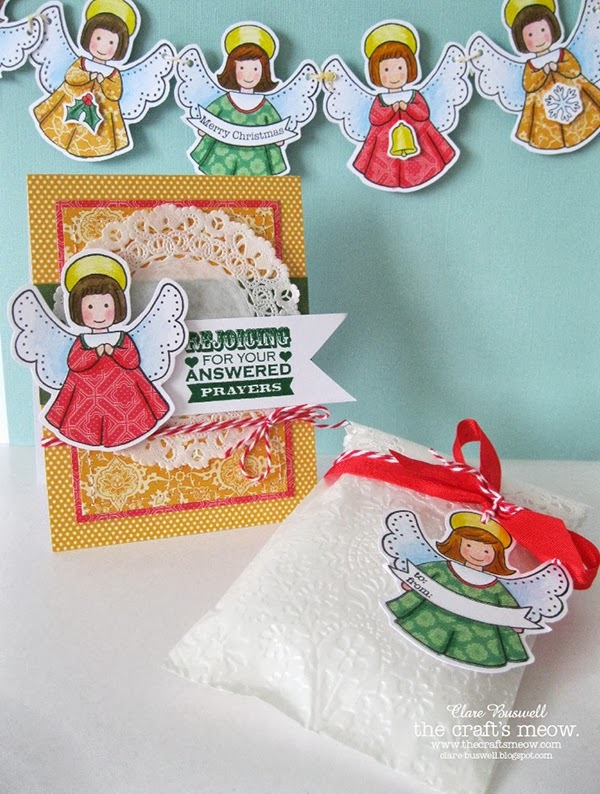 Wonderful projects made with these cute paper pieced angels! WOW!!! I love your angels! They are all so beautiful and beautifully colored too!!! Love the way you used this angel stamp. Thanks for sharing. What a geat idea! I love the banner! Thanks for sharing. Some mighty sweet angels - and I love the mustard/red/white color combo . . . I love seeing all the beautiful creations you ladies have made with these adorable stamps! Clare, All of your angel projects from yesterday and today are sweet! I love the paper piecing and pencil coloring, each one has her own personality! Thanks for the inspiration! The angel stamps are adorable. Love all the new stamps. Great projects. 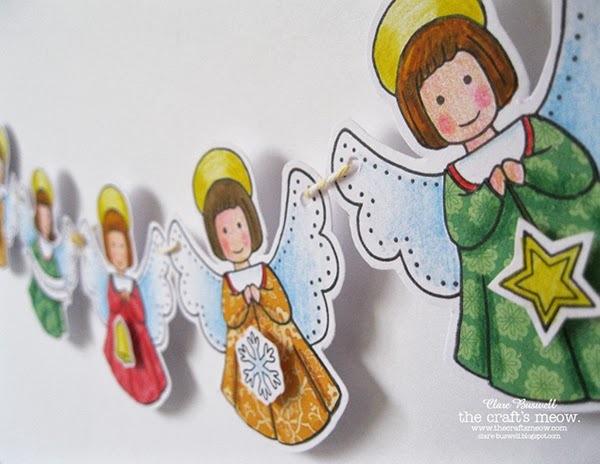 Your little paper pieced angels are all just adorable! Too cute! Your card is very cute and so are the angel cutouts. Thanks for all the great idea's. I love the little gift tags!! OH my goodness! I love your garland, card and gift tags that coordinate! This little angel reminds me of my mother's christmas cookies, so cute. The sentiment set is my favorite of the releases. Such lovely angels. Love the embossed bag and sweet banner. So many wonderful ideas for using the sweet angels! The card is beautiful...the tag is great use and the banner is so clever. 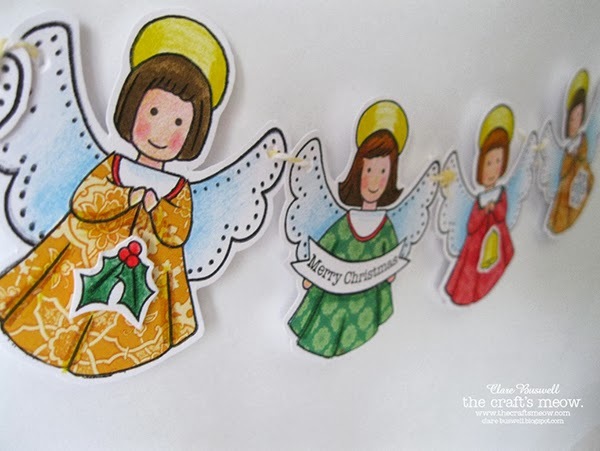 I really like the different ways you colored and paper pieced your angels. Super job! So cute! Love that you stamped out the angels as gift tags, very clever. Fantastic projects. 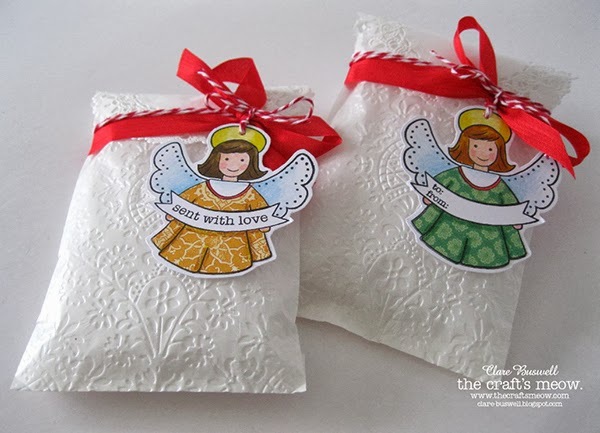 I love how you have used the little angel as a tag on the gift bags - wonderful idea. Oh, my gracious! 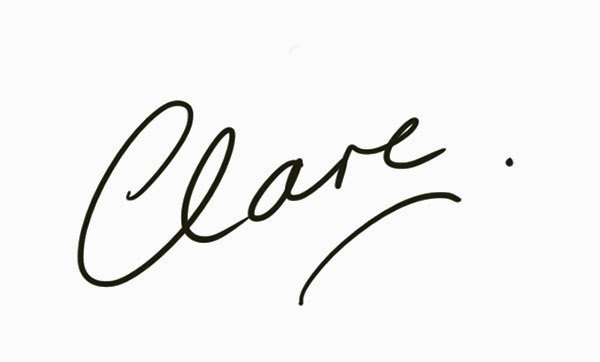 So much cuteness, Clare! LOVE that little banner!